Ice Cream, Sorbet, and Sherbet. © 2014 Getty Images, licensed to About.com, Inc. When buying ice cream, know that it all has air pumped into it. The most desirable is 20 to 50 percent air, which gives it just the right fluffiness and ease of scooping. Unfortunately, the only way to determine this is by weight. A pint with 25 percent air will weigh about 17 ounces after subtraction for the carton weight. The faster the freeze, the smoother the texture of the ice cream. Never let ice cream melt and refreeze. The result can be an unpalatable mess. 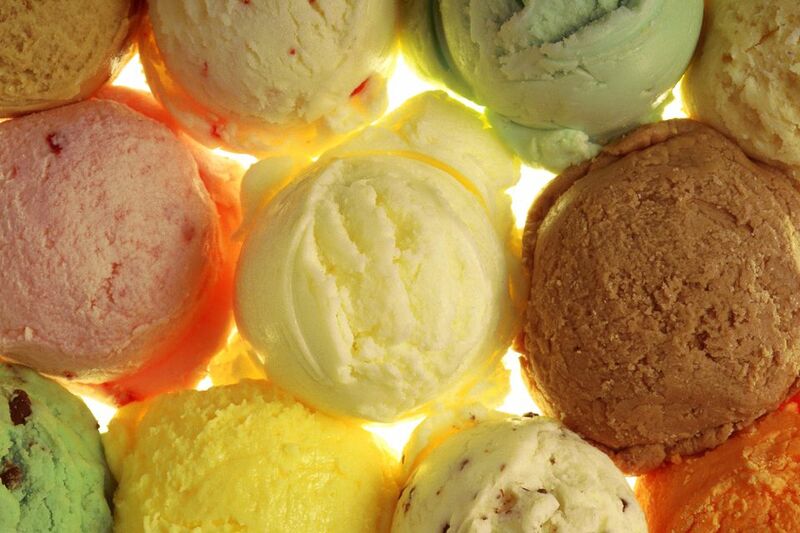 Ice cream is best when stored between -5 and 0 F.
Store ice cream covered so it does not absorb flavors from other foods. Make up mixtures for churn-frozen ice creams the day before you freeze, to increase yield and produce a smoother texture. As a rule, fill the churn/machine no more than two-thirds full to permit room for expansion. Allow 5 to 6 quarts of chipped or cracked ice to 1 cup of coarse rock salt for those old-fashioned machines, and let the ice stand about 3 minutes before beginning. For hand-crank machines, it's best to begin with a slow crank, about 40 turns per minute until you feel the mixture begin to thicken by resistance. Then triple your speed for 5-6 minutes. Add any chopped fruit after this step before repacking the salt ice and finishing with about 80 turns per minute for another few minutes to finish. Too much salt in the ice-packing mixture, overfilling the inner container with the ice cream mixture and/or churning too rapidly can result in a granular texture. For ices, use no more than 1 part sugar to 4 parts liquid. If there is too much sugar, the ice will not freeze properly. Any alcohol additions should be added after the ice has frozen. The larger the proportion of sugar or other sweetener, the slower the mixture freezes. Whipped cream or evaporated milk, melted marshmallows, beaten eggs, gelatin, rennet tablets and other ingredients are all additives used to prevent the formation of large ice crystals as well as to improve or vary flavor. Evaporated milk triples in volume when whipped whereas heavy cream doubles in volume. To substitute, use 1-1/2 cups whipped heavy cream for 1 cup whipped evaporated milk. Or, 1 cup whipped heavy cream will equal 2/3 cup whipped evaporated milk. A tip to avoid ice crystals: Add 1 envelope of unflavored gelatin per 6 cups of ice cream mixture. Let the gelatin soften in 1/4 cup of the mixture, then gently heat it until it is dissolved. Add to the remaining mixture and proceed. After your ice cream is done, let it sit in the freezer for about four hours before consuming it to let it develop flavor and texture.